As the project developed, the opportunity to create a physical space to support the textile work arose. The eventual building, completed in 2018, is a compact but densely programmed 120 square meter space. It is the home to a community center and new form of public space for Dali. The building helped make tangible a number of efforts and created an additional avenue for working with traditional craft and cultural preservation, namely traditional carpentry and stone-work. These male-dominated traditions are as central to the creation of Dong cultural identity as the textile traditions are for the women. A master carpenter is not only adept at the tradition of chuān dòu 穿斗 building and has been passed this knowledge through key lineages of masters that ensure continuity of tradition, they also act as both social and spiritual leaders in the community. 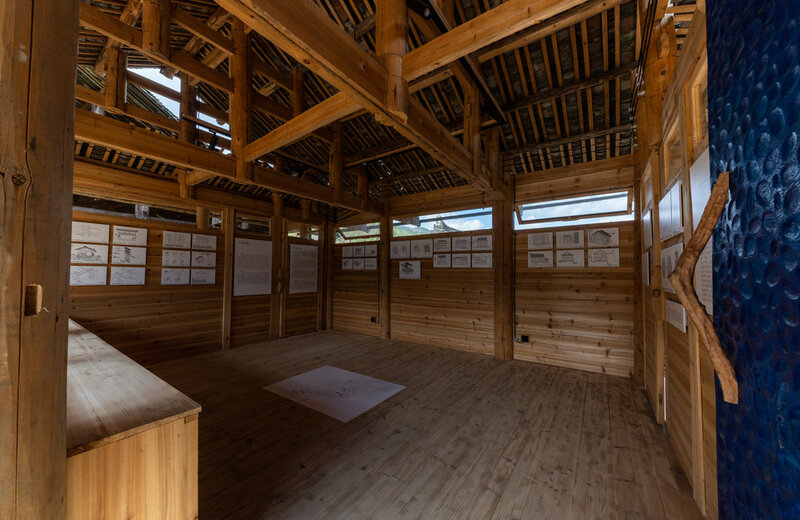 The process of designing and building the new community center was a lateral collaboration between ATLAS, GHF, and the builders in Dali both transforming and honoring tradition at the same time. As a new type of public space—the building is programmed to accommodate a number of needs and uses. Perched atop a steeply elevated site, the seemingly small edifice is in fact three stories tall. The top floor is entered from the village’s public plaza level and serves both as a kind of visitor and welcome center and as an exhibition space. In addition to that a portion of the space has been created to distribute books as a resource for the children in the village. The second floor houses a workshop for the developing textile cooperative. This is critically important because it creates a professional and neutral territory where the group is able to meet all together outside of any one person’s home and clarify the cooperative nature of their efforts and plan for future developments. It also makes the organizing efforts of the group visible by awarding it dedicated space within the village. Visitors to Dali are able to purchase the textiles here and learn more about the entire project. The bottom floor is a public space that connects both the plaza level down to the lane below and creates a garden and resting place that in a small but intimate way extends the potentials for public gathering within the village.